Justin Edinburgh has declared the Cobblers ‘won’t pay over the odds’ for any player, and that the club will ‘not be held to ransom’ as the Sixfields squad is rebuilt ahead of the new season. The Town boss is busy recruiting ahead of the new Sky Bet League One campaign, and confirmed the club is closing in on several targets. But Edinburgh has also made it clear he will not be rushing into any deals that will see players paid more than he believes they are worth, as he commits to ‘protect the club’. There has been some frustration among some supprters that more players haven’t already been signed. 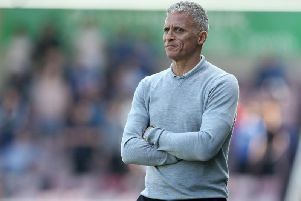 The Cobblers have to date made four new signings in Daniel Powell, George Smith, Sam Foley and Leon Barnett, and Edinburgh is ‘delighted’ with the business he has done. He admits he would have liked to have brought in more, but says people have to understand that getting the players you want is no easy task. “I don’t think the supporters’ frustrations are any greater than mine, but it’s not that straightforward,” said Edinburgh. “What the fans have to understand is that everything is being done for the right reasons and to protect the club. “In May and June, players do add a couple of extra noughts on their salaries because it is early and they feel that they are in a stronger position. “They feel it is early and people are making strong moves to get people in, but what we won’t do is pay over the odds for any player. “I feel every player has a value, every player has a price, and sometimes you do have to just nudge over that, and sometimes you get them for a little less, but I don’t think we will be held to ransom as a football club. With as many as eight players possibly still needing to be signed, Edinburgh knows there is plenty of work to be done. The players will be back in training at the end of this month, and the manager is keen for ‘the bulk’ of his squad to be tied down by then. “I said at the end of the season that did want things done the quicker the better, and that goes for the fans and their peace of mind, and it’s the same for me,” said Edinburgh. “You want to get all your jigsaw pieces in place and your focus and preparation is underway. “I would expect and hope to have the bulk of the squad in place by the time we report back for pre-season. “That is the aim and the plan and is what I believe we can do, and there is a lot of work going on behind the scenes that people don’t see.